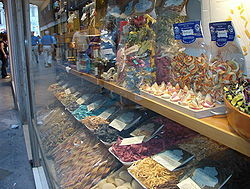 Pasta is a staple fuid o tradeetional Italian cuisine, wi the first reference datin tae 1154 in Sicily. ↑ Ehrlich, Richard (6 May 2009). "Process of Elimination". The Guardian. Retrieved 7 July 2012. ↑ McClatchey, Caroline (15 June 2011). "How pasta became the world's favourite food". BBC. Retrieved 23 March 2012. This page wis last eeditit on 4 October 2014, at 16:46.